Accident attorney, Byrl Lane, has been practicing law for over 30 years. 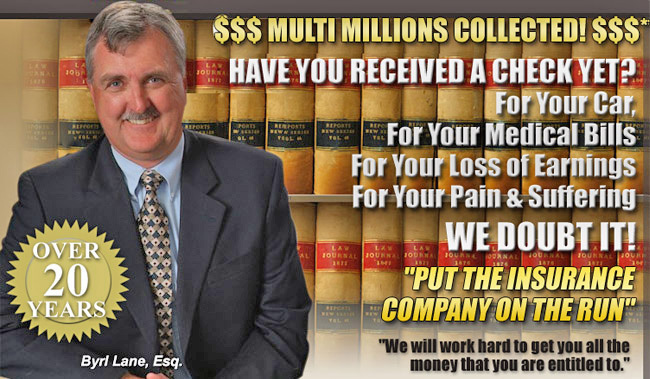 During which time he has collected MILLIONS in personal injury and car accident claims for his clients. Byrl Lane is a seasoned court room veteran; he has borne witness to numerous changes in the legal landscape firsthand and has consistently found what it takes to win. His experience and knowledge allows him to anticipate every potential outcome, enabling you to make the SMART decisions. Byrl is not afraid to take on huge cases such as the Northwest Airline Flight 255 crash, while still maintaining his passion for helping those in need, serving 9 years with the Arizona Association Defense Council. Our Arizona personal injury attorneys and car accident lawyers here at Car Accident Lawyer Champs will meet with you for in-person consultations as necessary. We are available for meetings in your office, your home, your hospital room, on the phone, on-line and in our offices. Of course, all consultations are provided free of charge to accident victims, and there is no time limit to the length of the consultation. Our personal injury lawyers knows what kind of trauma personal injuries can cause. Our auto accident attorneys work very hard to make sure your car accident claim is quickly processed and you get the largest benefit possible. Auto Accident injuries can shake up anyone, and our car accident attorneys completely realize this. It's always better to hire the services of a great car accident lawyer to make sure you receive the highest claim possible. We at Car Accident Lawyer Champs will provide you with a talented and caring accident lawyer who will ensure that you are aptly compensated.